Here an Independence Mobility, our number one mission is to help improve lives for the better! We’ve been supplying specialist healthcare equipment since 2004 and we’re proud to have helped improve the lives of thousands of customers, and we’re committed to helping many more. We work closely with the leading UK manufacturers to ensure we offer the latest innovative mobility solutions for consumers. We supply a wide range of specialist seating, wheelchairs, beds, children’s cycles, pressure care products, moving and handling equipment, and more, for both adults and children. As well as our commitment to consumers, we’re also committed to supporting and working closely with physiotherapists, occupational therapists and other clinical professionals. Our vast experience in the healthcare industry means we’re well-placed to provide advice and support to ensure clients receive the very best equipment for their unique and individual needs. Our team of knowledgeable and caring consultants provide impartial product advice and offer client assessments across our complete product range. We’re proud to be respected for our professional yet personal approach and we absolutely love what we do – helping to change a child’s or adult’s life for the better! 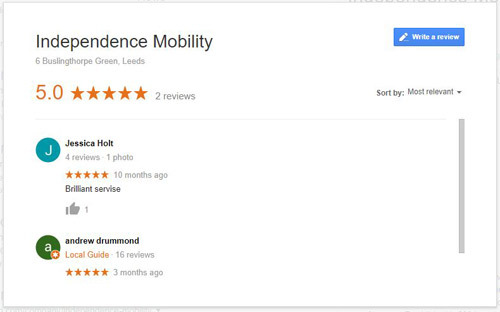 Independence Mobility began life back in 2004 as a small retail outlet on York Road in Leeds. We initially sold entry-level wheelchairs, scooters and beds directly to end-users with basic needs. Today, we are an established and well-respected provider of specialist healthcare equipment, supplying an extensive range of products that cater for a wide range of basic and complex needs. We still support end-customers directly but also now has very close links with occupational therapists, physiotherapists and other healthcare professionals throughout the NHS, as well as case management companies across the region. For the future, we're committed to continued growth. We make sure we keep up-to-date with new technologies and we'll continue to develop our product range to make new technologies a reality for our customers – whether that’s directly to the end user or through our work supporting clinical professionals. Our links with the leading equipment manufacturers enables us to remain completely impartial and recommend the very best equipment for a client’s needs without any limitation.